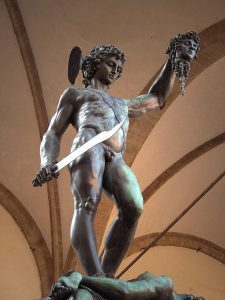 Perseus by Benvenuto Cellini, Loggia dei Lanzi, Florence, Italy. Source: JoJan, October 12, 2005, Creative Commons. The Perseids meteor shower is one of the most popular of the year! The name “Perseids” is derived from the Greek word Persedai who were the sons of the mythological hero Perseus. The Perseids meteors are the debris from a comet called Swift-Tuttle. If you’re in the Northern Hemisphere, the meteor shower can be seen July 17 – August 24, and its peak is visible the nights of Wednesday, Aug. 12 and Thursday, Aug. 13. This event isn’t like watching fourth of July fireworks: it’s better! The anticipation of waiting for a meteor to streak across the inky night sky is both exciting and fulfilling. Gazers must sit back and wait patiently for nature to release its shimmer across the atmosphere. For the maximum experience, prepare to spend a few leisurely hours admiring the night sky. Here are a few suggestions on how to comfortably view this month’s meteor shower. First, leave the city! 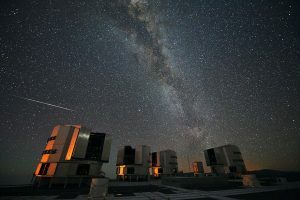 The 2010 Perseids over the VLT. Source: European Southern Observatory, Creative Commons. City lights brighten the sky making it harder (or impossible) to see meteor showers. Some of the best locations are rural areas, remote beaches, and deserts, but if you need something closer to the city, find a field, or county or state park situated on the fringes of the suburbs. Use this light pollution map to find the darkest locations in your area. Consider avoiding places with very tall trees as the line of sight for the showers would be obstructed. 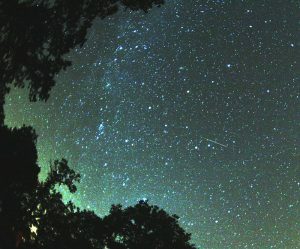 According to NASA, the best time to watch Perseids is after midnight until dawn, and hope for clear skies; if there’s overcast, you won’t be able to see the meteors. Next, plan to stay a while. You’re going to be observing meteors over the course of an hour or more. To avoid getting a crick in your neck, recline on a lawn chair or lay flat on a blanket. In those positions, you’ll see all of the meteors entering the earth’s atmosphere. Once a meteor streaks by, you can’t recapture the moment, so turn off cell phones to avoid distractions — live in the moment! Make a night of it and camp out under the stars, but just be sure to bring your bug spray. Finally, you may want to photograph the event. Sky and Telescope recommends using a wide angle lens, 16-mm f/2 lens for aperture, ISO 1600 for brightness, and setting the camera and lens to manual for focus. Lastly, some stargazers like to make a wish upon seeing a meteor, and with the Perseids showers, you can make a list of wishes. The following video is shared from Space.com’s YouTube channel, and is the property of Space.com.